Viorica is an active visual artist part of The Saugerties Artist Tour and The Artists Mile working at her ‘100 Studios’ in Saugerties, as well as, The Westbeth Artists Community working at The Morris-Stan Studios at Westbeth, NYC. Viorica’s work reflects her passion for both experimental photography as well as mixed media painting. Awards and scholarships include Seth Tobias Award, Paulette Goddard Scholarship, Westmoreland Art Nationals, and Black and White Award for Excellence. Her work has been published in Martha's Vineyard Magazine, The Vineyard Gazette, The Olivetree Review, Brooklyn Heights Press, Cobble Hill News, and American Metal Market among others. Photographic and Art Exhibitions in Pennsylvania, Tennessee, Massachusetts, Michigan, Missouri, Tompkins Square Library, Westbeth Gallery, The Tenement Museum, New York City. Her work is represented in private collections around the world. Whether in an ever expanding series of “Opening Night” pieces I have created for the various casts and crews of Public Theater productions (I have painted scenery for the New York Shakespeare Festival since 1987) or my visual interpretations of the fables of Aesop or even my series of Saints and Sinners, there is always at the root of my work a quiet call for interaction between the art and the viewer. Sometimes the call goes unheeded but the invitation to play is always there. My work as a painter has always been inexorably linked to my life in the theater. 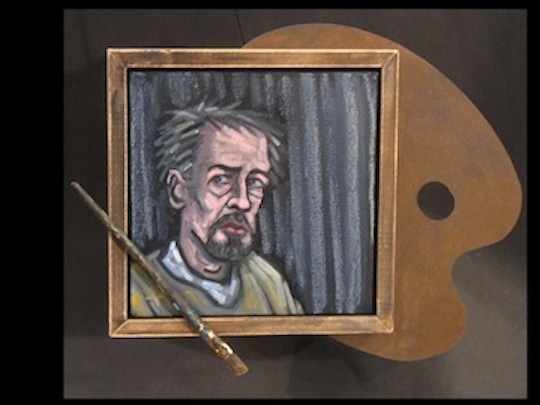 Each piece is a little (sometimes not so little) play: the painting is the performer and the frame is the stage. Some plays are best presented on a bare stage and some on stages with varying degrees of scenery. And to further beat this metaphor to death, under the best of circumstances a performance is enhanced by the surrounding scenic elements and not overwhelmed by them. It is that balance which I seek and it is that balance which I sometimes find.